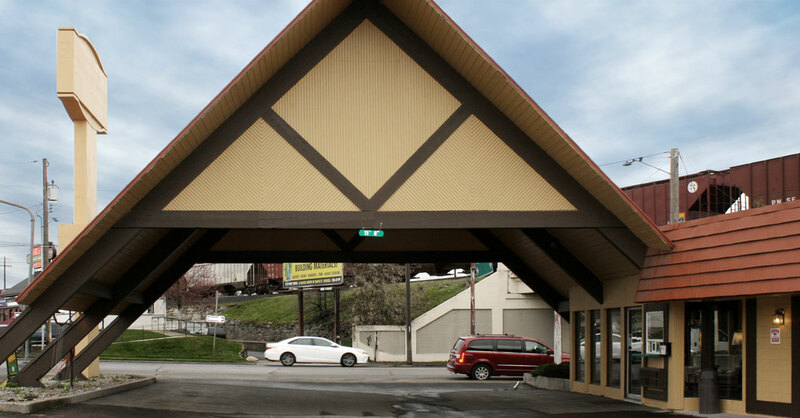 The Tiki Lodge was developed on the same block and at about the same time as the former Denny’s Restaurant – now Jenny’s Diner – and a 76 gas station. 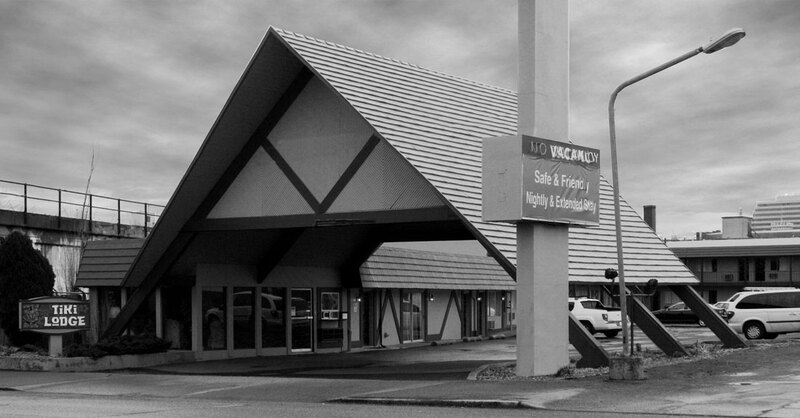 Both the Tiki Lodge and Denny’s share the Googie style of architecture. Also known as Roadside Architecture, Googie is named for the coffee shop in Los Angeles designed by John Lautner, and is renowned for its eye-catching forms and signs that are suitable for viewing at the speed of automobile travel. Googie is a vernacular style that emerged in the 1930s in Los Angeles, Las Vegas, and other tourist venues around the country that catered to automobile travelers, and where commercial development was popping up along commercial corridors and highways. The style is most often seen in restaurants and drive-ins, gas stations, and car dealerships. Googie signs are also often seen at mid-20th-century motels – such as this one – and hotels as well. 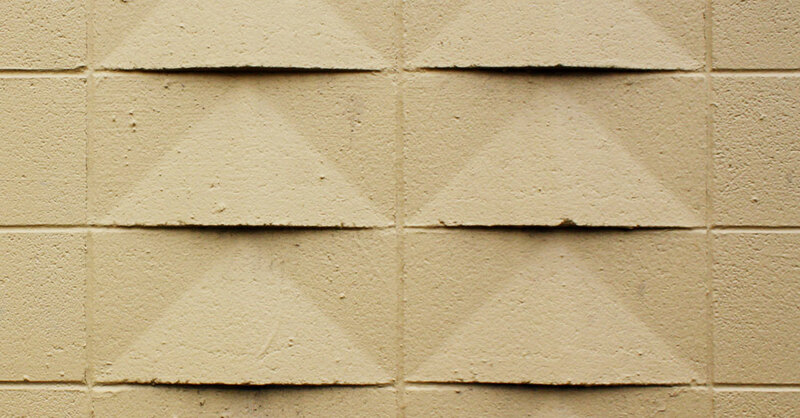 The design of the Tiki Lodge also fits squarely within the Tiki pop culture phenomenon of the 1950s and 1960s. Described as a “welcome escape” by Tiki historian Sven Kirsten, the popularity of Tiki in the post-war era may have been due to U.S. servicemen’s exposure to Polynesian cultures. Tiki is a Polynesian-based demi-god that originated in Maorian culture. Though a Tiki is the sculptural head representing the Tiki god; the word itself became associated with popular cocktails and, by extension, the restaurants and bars that served them. 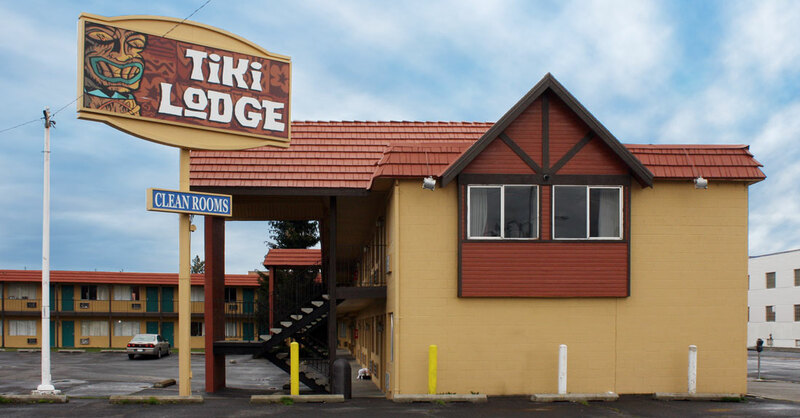 Tiki culture was manifested in Spokane in the 1960s in two motels – the Trade Winds and the Tiki Lodge – and one restaurant, The Polynesian. The Trade Winds, on W 3rd Avenue, is being redeveloped as a Howard Johnson Hotel; the Polynesian is now Anthony’s. 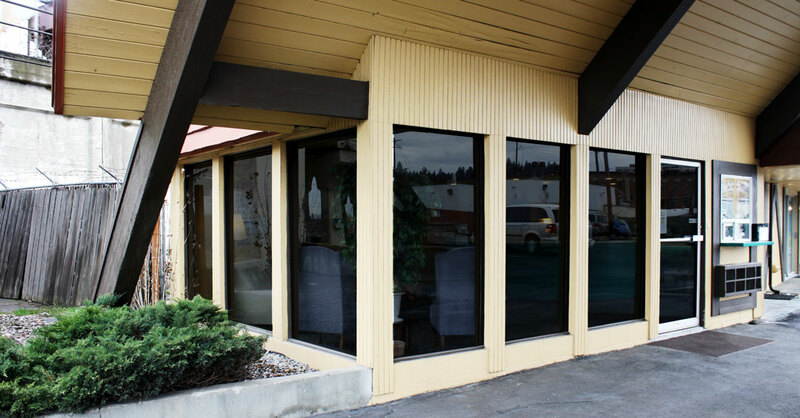 The Tiki Lodge may therefore be the only remaining Tiki-themed property of the post-war era in Spokane that has operated continually and maintained its Polynesian-inspired theme. The architect for the Tiki Lodge was Max Kevin. Research did not reveal further information about him.